If you're experiencing severe chest pain, you should call 999. If you feel pain around your heart, it’s understandable to worry. After all, the heart is an essential organ and any problems with it will likely have a severe impact on your health. 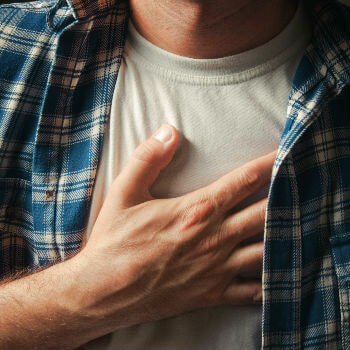 Pain in your chest doesn’t always mean there’s something wrong with your heart, but getting it checked out will give you peace of mind and potentially catch a problem before it develops into something serious. If you’ve had a persistent cough, this can put pressure on your chest muscles and, over time, lead to soreness and discomfort. You may also notice this when you’re breathing or laughing. In this case, it’s worth checking out the possible causes of the cough, rather than focusing on your chest or heart. You might also have strained a chest muscle as a result of physical exercise, such as stretching while playing sport. Heartburn is one of the symptoms of indigestion, but it doesn’t actually have anything to do with the heart. In fact, you’re actually experiencing gastro-oesophageal reflux disease (GORD), where acid from your stomach leaks back into your throat and causes an unpleasant burning sensation. There are various medicines available to treat this, while you may also need to change your eating habits - for example, by eating meals more slowly. Pneumonia - the sacs of air at the end of the tubes travelling away from the lungs fill with fluid, causing a cough and difficulty breathing. If you find you’re coughing up blood, you need to see a doctor as soon as possible. Pulmonary embolism - a blood clot blocking the artery to your lungs. This is another problem that requires medical attention as soon as possible. Pleurisy - the outer layers of your lungs become inflamed, causing chest (and sometimes shoulder) pain. Normally caused by an infection, it often clears up by itself, or there are. A panic attack has many possible symptoms, including chest pain, heart palpitations and trouble breathing, all of which can make you feel as though your breath has caught in your chest. This can, quite naturally, increase your feeling of panic. This is a mental health problem that is best treated by investigating what is causing you to panic in the first place. There are various talking therapies that will help you deal with situations better and avoid letting panic get the better of you. Angina occurs when the blood supply to the heart is blocked, usually because of an issue with your arteries. You may experience a tight chest, difficulty breathing and pain in your jaw, left arm and neck. These symptoms may lead you to believe you’re having a heart attack, but there’s a difference. Angina is often brought on by exercise or stress. The attack may only last a couple minutes, after which you’ll return to normal. If you experience chest pain along with shortness of breath, lightheadedness and stiffness in your jaw, shoulders and left arm while you’re at rest, you might be having a heart attack. These are caused by blood clots in your arteries. It should be noted that not every heart attack causes severe pain or discomfort, but it remains important to call an ambulance straight away. While you’re waiting for the ambulance, chewing an aspirin could help thin your blood and tackle the clot. Can grief lead to a ‘broken heart’? When someone suffers a bereavement, we often talk of them having a ‘broken heart’, but is this a genuine medical condition? Well, according to this BBC article, there are several reported cases of elderly couples dying within hours of each other. It turns out that there is indeed a condition called takotsubo cardiomyopathy (so-called because the heart’s left ventricle takes on the shape of a Japanese pot used for catching octopuses) that can be brought about by grief or “significant emotional stress”. Cardiomyopathy can also be caused by factors such as a sudden fright or work-related stress. Symptoms include chest pain and trouble breathing and you should call for emergency medical assistance, but the problem is treatable and many patients make a full recovery once the stress of their situation wears off. Chest pain is a serious matter and nothing should be left to chance. If you can’t breathe, or you think you’re having a heart attack, you (or someone near you) should dial 999 right away and call an ambulance. However, if you’re not in any immediate danger and have simply noticed some soreness, aching or occasional difficulty catching your breath, our doctors are here to help. We’re available from 7am - 8pm every day to help you make sense of your symptoms, and you can be seen in minutes.